Leg warmers keep your legs toasty warm and are fashionable as well. You can see them on the legs of dancers, yogis and fashionistas. If you know a bit about knitting, you should be able to knit your own leg warmers using the instructions below. 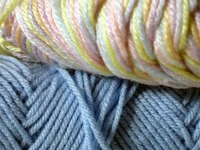 Choose a yarn in a texture and color that appeals to you, or make two mismatched leg warmers. Cast on 42 stitches using the circular knitting needles. Knit in ribbing stitch (knit one and then purl one) for 2 1/2 inches. Knit in stockinette stitch for 19 inches. Use a tape measure to ensure that you have reached the desired length. Repeat step number 2, knitting in ribbing stitch again for 2 1/2 inches. Weave the ends of the yarn into the project using the knitting sewing needle. Repeat all above steps to make the second leg warmer. This is a basic knitting pattern and can be completed by even a novice knitter. If you are unsure about your knitting skills before starting, go back and brush through knitting basics, such as knit stitch, purl stitch and stockinette stitch. Also, be sure you are confident casting on and binding off you project.